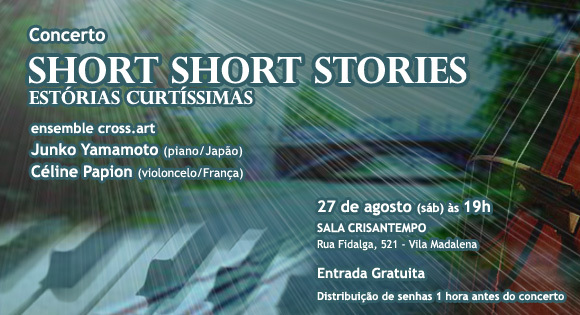 A Fundação Japão apresenta o evento “Short Short Stories” (Estórias Curtíssimas), que mescla música instrumental e multimídia no dia 27 de agosto de 2011, às 19h, gratuitamente, na Sala Crisantempo, na Vila Madalena, em São Paulo. 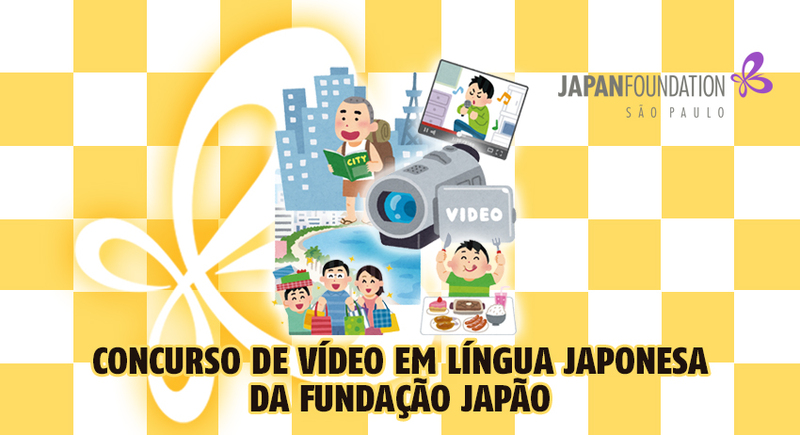 O evento conta com exibição de 3 vídeos com execução musical ao vivo, além de apresentações de piano e violoncelo, totalizando 18 peças, tocadas pela japonesa Junko Yamamoto e pela francesa Céline Papion, respectivamente, do conjunto ensemble cross.art, que tem como conceito central combinar a música instrumental contemporânea com outras mídias e formas de arte. Serão apresentados 2 vídeos, para os quais foram especialmente compostas as canções “Moment-performatives spazieren” (composta pelo alemão Oliver Frick) – grande vencedor no 12º Japan Media Art Festival, em 2009 – e “Moment performative Curitiba” (composta pelo norte-americano Joseph Michaels), este filmado em Curitiba, ambos do artista japonês Yukihiro Taguchi, que expõe atualmente no Mori Art Museum, em Roppongi Hills, em Tóquio. A obra de animação de Taguchi, artista plástico de Osaka radicado em Berlim, produzida a partir de inúmeras fotografias, juntamente com a execução da música ao vivo, possibilita transbordar uma vibração pictórica única. No caminho inverso, a música para qual foi produzido um vídeo “Clash Music” (composta por Nikolaus A. Huber) revela o sincronismo entre a sonoridade dos címbalos e as imagens monocromáticas produzidas por Sonja Füsti em parceria com Patrick Hilss. O programa do concerto inclui homenagem a compositores emergentes do Japão, Alemanha e Brasil, e durante a apresentação suas partituras poderão ser acompanhadas num telão, todas tocadas por Junko Yamamoto (piano) e Céline Papion (violoncelo), que também participam da I Bienal Música Hoje, que acontece entre os dias 29 de agosto a 04 de setembro de 2011, em Curitiba, no Paraná. Músicas inéditas de Tomoko Fukui e de Takeo Hoshiya, como “The Cello in February (O Violoncelo de fevereiro)”, e também dos brasileiros Mauricio Dottori, Harry Crowl, Fernando Riederer e Edson Zampronha, que compuseram especialmente as peças para este concerto, serão apresentadas. Da Alemanha, obras como “Child’s Play (Brincadeira de Criança)” de Helmut Lachenmann para piano, “Pression (Pressão)” para violoncelo, ou “Zodiac (Zodíaco)” de Karlheinz Stockhausen, carregam sonoridades que desafiam a primeira audição, fazendo com que o público duvide da veracidade sonora dos dois instrumentos. Nascida no Japão, estudou música de câmara contemporânea com Peter Eötvös, em Colônia, e piano com Claude Helffer, em Paris. Atualmente leciona na Universidade de Música, em Stuttgart, desde 2004, além de ser professora convidada na Jinai Univerisdade, no Japão, e na Universidade de Música, em Basel, na Suíça. É também fundadora e diretora artística da ensemble cross.art. Recebeu o terceiro e prêmio especial para música contemporânea espanhola no “Xavier Montsalvatge Competition“, na Espanha, e prêmio máximo no “Experimental Sound, Art & Performance Festival Tokyo”, além do “Phoenix Evolution”. Foi requisitada, como artista convidada, para inúmeros festivais musicais, tais como: Strasbourg International Music Festival “Le festival musica” (França), “Bartok International Festival” (Hungria), Musicarama International Festival” (China), “Experimental Sound, Art & Performance Festival” Tokyo e “Takefu International Music Festival”, ambos no Japão. Suas performances foram transmitidas pelas Südwestrundfunk e Saarländischer Rundfunk (Alemanha), NHK (Japão) e Hungarian Radio 3 (Hungria). Nascida em Orléans, na França, estudou – primeiramente – com Raphaële Sémézis, posteriormente com Ophélie Gaillard e Professor Philippe Muller, em Paris. Na época, já havia ganho diversos prêmios, antes de mudar para Staatliche Hochschule für Musik und Darstellende Kunst, em Stuttgart (Alemanha), em 2004, onde estudou sob orientação do professor Jean-Guihen Queyras, completando seu treinamento artístico em 2008. Em julho de 2010, termina sua pós-graduação, como solista, com o professor Francis Gouton na Musikhochschule, Trossingen, também na Alemanha. Como solista e música de câmara, participou de diversos festivais como o Rouffiac d’Aude Festival (França), Taïnan International Summer Music Festival (Taiwan), Amsterdamse Cello Biennale (Holanda), Händel-Festspiele (Göttingen), Festival European Church Music Schwäbisch Gmünd (Stuttgart) e Festival Klang.körper Köln (Colônia), todos na Alemanha. Recipient of the Pulitzer Prize for 2008, Steve Reich has been called ‘America’s greatest living composer’ (The Village Voice),‘…the most original musical thinker of our time’ (The New Yorker) and ‘…among the great composers of the century’ (The New York Times). A leading pioneer of Minimalism, Steve Reich’s music has been influential to composers and mainstream musicians all over the world. His music is known for its steady pulse, repetition and a fascination with canons. He combines these rigorous structures with propulsive rhythms, seductive instrumental colour and harmonies drawn from non-Western and American vernacular music, especially jazz. Clapping Music (1972) is a minimalist piece written for two performers and is performed entirely by clapping. A development of the phasing technique from Reich’s earlier works such as Piano Phase, it was written when Reich wanted to (in his own words) “create a piece of music that needed no instruments beyond the human body”. However, he quickly found that the mechanism of phasing slowly in and out of tempo with each other was inappropriate for the simple clapping involved in producing the actual sounds that made the music. Instead of phasing, one performer claps a basic rhythm, a variation of the fundamental African bell pattern in 12/8 time, for the entirety of the piece. The other claps the same pattern, but after every 8 or 12 bars s/he shifts by one eighth note to the left. Helmut Lachenmann composed the third part for Violoncello for the piece “Invention in d-moll BWC 775” for Piano. was born in Rio de Janeiro, Brazil. Between 1997 and 2002 attended the EMBaP (School of Music and Arts of Parana, Brazil) studing composition with the Prof. Maurício Dottori. Since 2003 Fernando lives in Vienna, Austria and studied electronic composition at the University of Music and Dramatic Arts of Vienna. Since 1995 has been partipating of Festivals, competitions and projects at diverse European countries and Americas, such as Biennale of Contemporary Brazilian Music of Rio de Janeiro and Wien Modern (Vienna). At 2006 Riederer, Dufek and Breidler fund “Platypus – Verein für neue Musik”, (www.platypus.or.at). 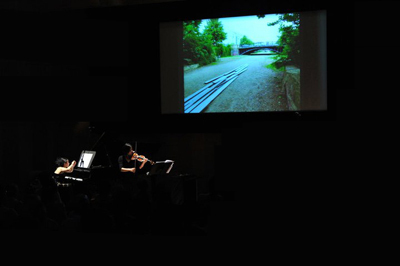 The group organises projects such as Marathon of Compositors – Festival to Youth Contemporary Music, international exchange projects and the Ensemble Platypus. Widely acknowledged by critics as one of the most important but also controversial composers of the 20th and early 21st centuries, Stockhausen is known for his ground-breaking work in electronic music, aleatory (controlled chance) in serial composition, and musical spatialization. His works, composed over a period of nearly sixty years, eschew traditional forms. In addition to electronic music—both with and without live performers—they range from miniatures for musical boxes through works for solo instruments, songs, chamber music, choral and orchestral music, to a cycle of seven full-length operas. His theoretical and other writings comprise ten large volumes. He received numerous prizes and distinctions for his compositions, recordings, and for the scores produced by his publishing company. Zodiac (1975) consists of twelve melodies, each representing one sign of the zodiac. Described by one early critic as “melodic naïveté” in the form of “cheerful, empty-headed little tune[s]” (Kenyon 1980, 78), Tierkreis has proved to be Stockhausen’s most popular composition. Tierkreis was originally written for music boxes as a component part of a theater piece for percussion sextet titled Musik im Bauch (Music in the Belly). These twelve melodies (with or without their accompaniments) form an autonomous work which can be played by any suitable instrument, and exist also in versions to be sung. On the initiative of the Committee for Art and Culture of the City Council of Cologne, from 6 July 2009 the melody from Tierkreis corresponding to the current Zodiac sign is played daily at noon on the newly restored 48-bell carillon in the tower of the Cologne Town Hall, as a tribute to the composer. was born in Oberlin, Ohio, USA. He recently completed his dissertation, the topic of which was the music of Erik Oña, and received his doctorate from Northwestern University (Chicago, USA). Michaels’ music has been performed throughout North America and Europe by such ensembles as the Eastman School Symphony Orchestra, Michigan State Trombone Choir, Verederos Flute and Percussion Ensemble, Tarab Cello Ensemble, Scott Kluksdahl, Ensemble SurPlus, Ensemble Cross.Art, Ensemble Cordiale, and Ensemble Gelber Klang. His music for acoustic and electronic instruments explores extended techniques, alternative intervals and tuning systems, as well as music in combination with other artistic mediums, like film, theater, and the visual arts. Michaels lives in Stuttgart, Germany. ein Privat Haus Take down and that part of Wood Material using for project. Taguchi Yukihiro (*1980), the Berlin-based artist has garnered much attention in recent years for his unique “performative installations,” which combine elements of drawing, performance, animation and installation. His video works show everyday objects such as furniture and even the floorboards in his studio dancing as though imbued with spirits of their own. Made by joining still images together, the works are animations in the classical sense, but they also provide hints for the present. has received two awards from the São Paulo Association of Art Critics, Brazil, and he won the 6 Sergio Motta Award, the most outstanding prize on Art and Technology in Brazil. He has received commissions from different groups and institutions, as from the Museum of Applied Arts, in Cologne (Germany); from the designer María Lafuente (Spain), and from the São Paulo State Symphonic Band. His compositions are included in two CDs fully dedicated to his works (Sensibile and Modelagens) and in other fifteen CDs released by different record labels and institutions. He is a researcher at the University of Valladolid ; a senior professor at the Music Conservatory of Oviedo, and a Consulting Professor at the Valencia International University, all in Spain. He has a Ph.D. in Communication and Semiotics – Music – by the Pontifical Catholic University of São Paulo. He is the author of the book Notation, Representation and Composition (Annablume, São Paulo, 2000). Born in 1979. Takeo Hoshiya graduated from Tokyo National University of arts and music in 2002. He studied composition with Jo Kondo and Shin Sato. In 2003, He founded contemporary music group named “Ensemble Bois” based on Tokyo and he also organized many concerts with his ensemble. He is also menber of the“Ensemble Contemporary α” in Tokyo. In 2005, his work were introduced by the Ensemble Nomad in Huddersfield Music Festival. The cello in February was composed in Sapporo city. I was impressed by scene of February winter in Sapporo. In Sapporo, it snows very much and the temperature is very low every winter. In this work, there are many quarter tones. and these quarter tones generate “neutral third” which is the most important interval in this work. is a Brazilian composer and musicologist. He was a pupil of the great clarinetist José Botelho, at the Villa-Lobos Music School, in Rio de Janeiro. A self-taught composer, he further studied composition for musical theatre in the Scuola di Musica di Fiesole in Florence, Italy, with Sylvano Bussotti and Mauro Castellano. He has a Master of Arts degree from the University of São Paulo, Brazil, and a Ph.D. in Music from the University of Wales, Cardiff, United Kingdom. From 1992 to 2002 he was Professor of composition and counterpoint at the School of Music and Fine Arts of Paraná, in Curitiba, Brazil. Since 2002, he has been Professor at the Federal University of Paraná in Curitiba, where he also teaches Electroacoustic Music. He is the director of Nova Camerata, a chamber group specializing in contemporary Brazilian music. Along with his work as composer and teacher, Dottori has also published musicological works; his research includes studies on 18th-century Brazilian and Italian music, and, more recently, on neuro-cognitive systems as they concern the composition of music. 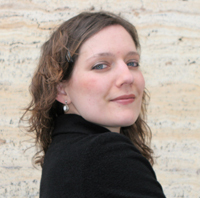 Dottori was the recipient of a 2002 Claudio Santoro Composition Prize from the University of Brasilia and a 2011 Funarte prize, both for orchestral pieces. Like many composers from Rio de Janeiro of his generation, Dottori’s music had initially elements originated in Brazilian late-nationalist aesthetics. Under the influence of other music, especially that of Sylvano Bussotti and John Cage, these elements gradually became less and less important. Dottori’s recent music has an increasingly a post-atonal style, in which structures based on the twelve-tones set are filtered by the sensibility of the ear and aspects such as superstructural ornamentation, which were rejected by the modernist tradition, became prominent. Invited or commissioned by “La Biennale di Venezia ‘02”, Daegu(Korea) music festival (‘04), Takefu music festival(‘05), International Summer Course of New Music in Darmstadt(‘94,’96,’06), Seoul Pan Music Festival(‘06) etc. Selected for ISCM World Music Days-Hong Kong ‘02, ISCM World Music Days-Zagreb ‘04. Pieces are performed in many places in Europe or Asia etc. by many performers. Organizing the Ensemble “next mushroom promotion” which plays contemporary music mainly. This Ensemble got Saji-Keizo prize in 2005 that is given to the Ensemble which held the most interesting and challenging concert in a year in Japan. Instructor of Osaka College of Music and Kanseigakuin Univ. Living in Tokyo. Color song comes from “Bisbigliando” which means the trill with different fingerings for the same pitch. This technique is called “color trill “ in English. I have already composed many pieces which I used such kind of technique and other special technique to get many kind of timbre on one pitch as the series of “ a color song “. This piece is also one of them. This time I chose “G” note just because of the mechanical structure of cello and piano. I would like you to listen to various colors on G.
It must be 15 seconds for a television commercial as the basic length in Japan. Or we have the poetry, “Hai-ku” with a fixed form which is made with only 17 syllable (actually these are 17 mora in Japanese), however it can convey many information, a season, a scene, a imagined scenery, an ideology, feelings, etc. is a Brazilian composer of classical music born in Belo Horizonte, Brazil. First music studies in his native town. He went on to study in the US with Charles Jones, both privately and at the Juilliard School of Music. Later, he also earned a degree in English and Portuguese in Brazil. Further composition studies under Peter Sculthorpe in Dartington, England. Living in Curitiba, southern state of Paraná, he is currently the Artistic Director of the Federal University of Paraná’s Philharmonic Orchestra and Professor of composition and music history at the School of Music and Fine Arts of Paraná (EMBAP). He also produces and presents radio broadcasts on both classical and contemporary music for the State of Paraná Educational Radio. Harry Crowl’s production comprises all genres of instrumental and vocal music ranging from solo to orchestral, from songs to opera. There are 130 pieces on his catalogue to this date. His music has been performed and broadcast all over the world. As a musicologist, he discovered, compiled, edited and published some important late 18th century music by Brazilian composers of religious music. Tillandsia stricta solander is a bromeliad found in the coastal regions of southern Brazil. The piece suggests a very brief sight of it. Something like a musical photo. working as musician since 1992. studied composition, musictheory and new media in Stuttgart, Paris and Freiburg i.Br. since 2007 working as ,Tonmeister’ at the State Opera Stuttgart and teaching ,Klanggestaltung’ at the Stuttgart State Academy of Art and Design, since 2008 teaching computermusic at the State University of Music and Performing Arts Stuttgart. His works are being performed around the world by various ensembles like ensemble recherche, ensembla ascolta, mutare ensemble, ensemble cross.art e.g. In the movie “Moment – performatives Spazieren” the timber piling of a room promenade through summery Berlin. Yukihiro Taguchi is moving them one after the other and takes photographes of the constellations. These frozen moments were mounted to a film which results in a tremendous ride through the artificially crafted moments – each an artwork of its own, fugitive, only lasting for a short instant – just as long as it takes to take a photograph for freezing the moment. This constant melting of the moment is an inevitable fate of music, in which it is deeply rooted as it is an artform which only exists in time and cannot be paused or stopped without the music vanishing or being destroyed. The work of the composer is therefore a search for the perfect moment and the attempt to keep it – over and over again – a hunt for the moment. Huber’s concentration on the periphery of what generally seems normal or natural, and thus harmless, in the treatment of musical material lets him accede to music alongside which a space for utopias and speculative thought has been cleared: a stance that makes him one of the few guarantors for progress in music. Sonja Füsti was born 1975 in Leonberg, Germany. First she studied visual arts at the Staatliche Akademie der Bildenden Künste in Stuttgart/Germany. After her degree she continued with media arts and scenography at the Hochschule für Gestaltung in Karlsruhe with Michael Simon and Penelope Wehrli until her diploma in 2005. During her studies she worked with Christoph Schlingensief. 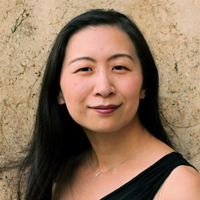 Besides that she developed own interdisziplinary works in the field of Music theater and Performing arts. Since her diploma she worked as an freelance assistant stage designer at The Göteborg Opera (director: Philipp Himmelmann). In 2006/2007 she worked as an assistant for stage and costume design at the Schauspielhaus Bochum/Germany and from 2007 to 2009 at Münchner Kammerspiele Munich/Germany. 2009 and 2011 she is fellow of Akademie Schloss Solitude Stuttgart/Germany. Next season, she will work as stage and costume designer for »2012 – Das Ende der Welt« directed by Chris Kondek, and will be responsible for costume design in the team Nübling, Gerstner, Wittershagen for »Ubu«, a coproduction in Essen and Amsterdam. Karlsruhe; since 2002 he is working as a freelance designer and photographer, among others for Zentrum für Kunst und Medientechnologie (ZKM) Karlsruhe, Schirn Kunsthalle Frankfurt; Since 2003 Patrick Hilss works as artistic assistent for Christoph Schlingensief, since 2004 he is responsible for the archive of Christoph Schlingensief and realized he realized several websites for him during that time. Equally the third player appears on the stage. Contrary to the two real cymbal players the third one appears two only as a video image. The video is an abstracted sampling from the playing of the two actual player. Real time and conserved time constitute a temporally limited ensemble.